Or, save the date! In designing wedding related paper goods, one of my favorite things to create are Save the Dates. I love the sneak peek of a couple's wedding invitations or sharing those beautiful engagement photos. I recently created some new designs for Minted, which will launch in a few months. I focused on classic, chic style with elegant and timeless fonts. Here's a look at those upcoming designs. I've been doing a lot of behind the scenes designing lately for Minted, and if you follow me on Instagram, you've seen a design or two that I've been working on. Quite a few Minted Design Challenges have transpired lately, and I have some fun creations to share that will be available on Minted.com soon! First, Minted has introduced a brand new category of stickers! The five designs above were chosen among over 1,100 entries to be sold. Some coordinate with designs I already have for sale, and some are brand new creations. Next, came the big wedding challenge, which is one of the biggest of the year. I submitted a varied selection of designs, from uber minimal to over-the-top romantic. Below are just a few of my favorites, and ultimately, sweet and romantic won out. That beauty in the upper left corner got selected by Minted to be sold coming this Spring! And while my favorite of the bunch didn't get selected (that modern criss-crossed design on the bottom right), the good news is that I will be launching a group of brand new wedding suites on J. Amber Creative, inspired by these entries. I can't wait for you to see them! And lastly, I've had baby fever! No, not that kind. I've been creating brand new birth announcements for Minted's annual birth announcement challenge. Voting is still happening now, so if you'd like to vote for these and many many more, head over to Minted and cast your vote on which designs they should sell! The most wonderful time of the year for most is still a few months away. However, here in the studio, it's arrived! 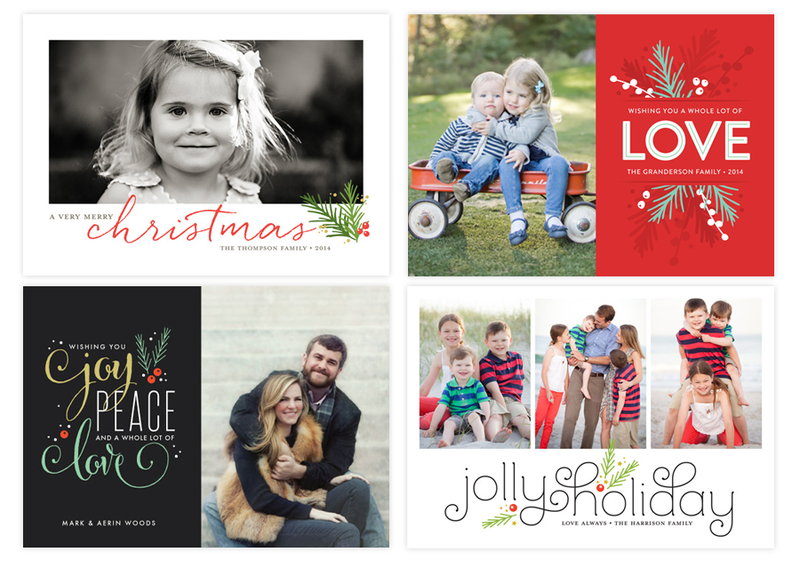 Minted has begun to announce the winners of their annual holiday card challenge. This is the biggest challenge Minted holds each year, and the numbers don't lie! There were a total of 4,103 designs submitted from 481 artists around the world. Minted is counting down to the top designs, and so far has announced the top 21 - 50 designs. And I have been blessed enough to have TWO designs place. That's my Snowy Woods design at number 24, and my Family Album design at 42. I can't wait to see what gorgeous designs take spots 1-20 as Minted reveals those winners over the next few weeks. For the past six weeks, I have been in a holiday state of mind. It's Minted's BIGGEST challenge of the year - Holiday Photo Cards, and voting is open now until Tuesday, May 27th. I'm incredibly proud of this holiday collection. I submitted twenty designs, shown below.